We look at your business! If you are looking for a prompt, cost-effective and professional review of any aspect of your organisational, business or financial affairs, based on a detailed understanding of what answers you are seeking, then look no further. The Principal of the Firm has enjoyed successful public professional practice for many years, having been involved in a wide variety of assignments located within a wide range of professional offices in Australia and Overseas. Click here to view a copy of his Résumé. Proper professional practice has always meant more than the numbers or the money to the Principal of this Firm and he has built a culture within this firm of service to our clients. The first thing to note is that we are receptive to our client’s needs. Before we finalise our appointment to any assignment, we listen, we seek to understand, we seek in turn to be understood and then we co-operatively define the engagement with our client, ensuring a clear and mutual understanding of each other’s expectations to go with our respective signatures to the document. Personal involvement by the principal in all client engagements, working within a team of suitably qualified staff, ensures that we complete assignments in a cost effective manner. Naturally, knowing that Chartered Accounting Firms are subject to random Quality Reviews, that all Chartered Accountants are required to carry out regular, targeted continuous professional development studies and that all work in any area is subject to rigorous and stringent professional standards with the force of law gives you reassurance that your work will be carried out to best practice. To explore details of the scope of professional activities conducted by this Firm, click on the tabs above. You can utilise the experience and expertise of this firm to your advantage by using the contact page for an obligation-free assessment of your circumstances. The Principal is experienced in the audit of all types of organisations and business structures, such as unlisted public companies, international enterprises, subsidiaries of foreign organisations, family businesses structured as proprietary companies, trusts and partnerships, statutory audits of legal practitioners, property agents and motor dealers trust accounts, APRA and SMSF superannuation funds, public sector and not-for-profit organisations such as incorporated associations, hospitals, charities, foundations, professional associations, and charitable trusts. Pursuant to our professional code of conduct, we undertake regular reviews of our audit processes to ensure best practice, while providing the most cost effective procedures. Naturally, this includes the use of continuously updated in-house audit software techniques. Up-to-date Australian Auditing Standards are considered for relevance to the assignment and their requirements incorporated into the audit process. Audit integrity is very important. The audit processes to be used in any assignment are derived from a professional consideration of the circumstances of the client and the responses contained within the firm’s frequently updated audit toolkit. Matters considered during Audit planning include risk assessment, system documentation and reviews, and the design of effective and cost efficient procedures to be used for testing and verification, including materiality levels. 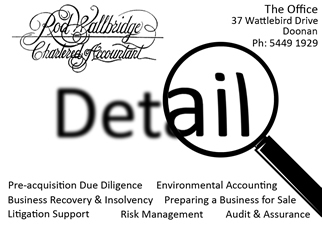 Our audit processes are based on a thorough understanding of each client, its industry and its environment. Informed by this understanding, existing controls and the risks of material misstatement of the financial statements are assessed, including those caused by the risk of fraud. Audit procedures are then designed and performed to address those risks. Both quantitative and qualitative methods are used to determine the extent of our work. Consideration is given the need for specialised skills in the planning, performing, and evaluation of our procedures. As work progresses, and greater understanding of the nature of the assignment is gained, the audit processes are updated in an iterative manner to take account of that knowledge. We also carefully review the results of our procedures to reach an opinion on the financial statements and determine whether our risk assessment and audit plan are appropriate. Because the audit process is fully integrated with and supported by our professional audit toolkit, our audit staff have access to detailed guidance that is geared to their level of experience which guides them throughout the process, while also allowing for an appropriate level of professional judgement. Naturally, we will report any matter requiring the attention of management as soon as practical after its discovery. At times and to a level of detail agreed and specified in our letter of engagement, we will provide you with management reports to ensure that what is learnt through the audit process is fully disclosed and understood. Our approach is rigorous and delivers a high level of consistency to clients across the practice. Early diagnosis is the most effective way to avoid severe financial difficulties in business. In the unfortunate circumstance where corporate insolvency is the only course, our aim is to provide all parties with a strategy that is in the best interests of all concerned. If your financial results don't quite add up and you are unsure as to what has happened, please consider using our Forensic Accounting services for a timely, cost effective and professional review of them. The cause, whether it is business, fraud or system related will be identified and confidentially reported to you. Should the results of the forensic investigation prove that fraud or defalcation has occurred, the methodology and documentation utilised by this firm is of sufficient standard to be used in any subsequent action to resolve the matter, be it by way of litigation or alternative dispute resolution. The Principal has experience in providing Alternative Dispute Resolution services, a process which often provides a cheaper, faster and more equitable result for parties at odds with each other. It is cheaper because it avoids the use of lawyers, faster as it does not involve waiting for Court time, and more equitable, because the end result can be a win-win [even if not a complete win!] for both parties, rather than the mandated win-loose which is the inevitable outcome of a court case. Please refer to the Australian Government's advice by clicking here for an overview of the process. You can utilise the experience and expertise of this firm to your advantage by using this page for an obligation-free assessment of your circumstances. ©Copyright Rod Wallbridge - All Rights Reserved.